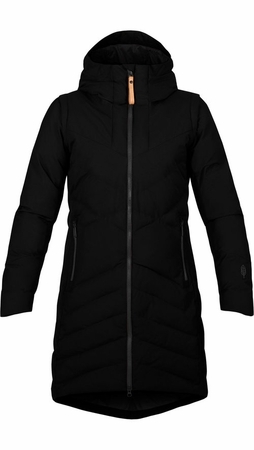 The KROLOWA jacket has a smooth, light and technical fabric that will follow your every move. Its soft, waterproof and breathable coating keeps you dry from the elements and evacuates moisture vapor. The surface of the fabric is treated with a durable water repellent finish. Specifications: YKK Vislon 2 way zip, Removable leather puller, Strategically seam sealed, Fixed & adjustable hood, Chinguard, Articulated Sleeves, Inside zipped pocket, Riveted rubber logo, Woven logo labels. Insulation: White duck down (80% down/20% feather), bagged in a Nylon downproof canvas (650 fill power in in3/oz). We partner with suppliers which are registered with the Responsible Down Standard (RDS). The goal of the RDS is to ensure that the waterfowl used in the down supply chain are treated humanely. The construction of this garment emphasize flexibility and lightness. In addition, its fabric composition will keep you dry from the elements and evacuates moisture vapor. This is critically seam sealed. "